Councillor Robert Nemeth has called for a ‘rooftop revolution’ to do something with Brighton’s ‘wasted roof space’. Visitors to the i360 look across a pretty desolate landscape north over Brighton. Here at Building Green we couldn’t agree more and will seek a meeting. We’re pleased to see the Aroe MSK installation on the Hilton roof, but think green roofs would be a greater contribution to the health of the city. Read the article in the Independent here and here. 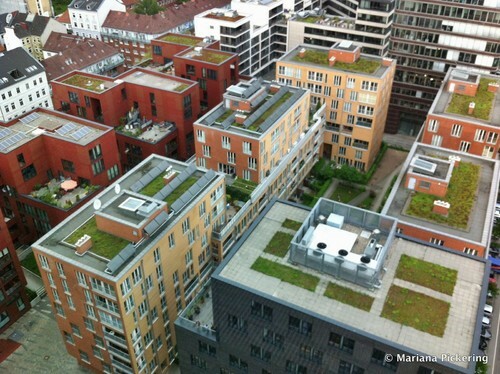 In London there are planning requirements for green roofs and walls on developments over a certain size. In Germany and Switzerland things are rather more established, with Government incentives that encourage greening that creates benefits for storm water management. Portland does this too, with it’s Ecoroof incentive. That’s the gauntlet for Brighton & Hove then – develop the incentives and policies to make the city a leader in making the most of that ‘wasted space’. A hella better view for i360 tourists too!